We all love our furry four-legged friends, and we go out of our way to make sure that they are healthy, happy, and well loved. Many people make an effort to dog proof their house, whether that involves locking cabinets, putting rugs down, or otherwise. It’s important to protect both your dog and your home from any trouble your dog might get into. It’s important that your dog has a place that it can feel is theirs within your home, and that’s why most pet owners take many of these precautions. There are a few situations that can be hazardous to pups that may not be immediately obvious, and we’re going to discuss them below. Have you ever stopped to consider that a garage door could be a potential point of injury for your dog? Years ago this was much more common of an issue back before additional safety cautions were installed. A closing garage door could potentially close on your dog, which could cause extreme amounts of injury and could even be fatal. More recently garage door openers have been required to be built with sensors that prevent this exact accident from happening. If something blocks the sensors while the garage door is trying to close, then the garage will turn around and open back up. It’s important that you have an updated garage door opener that utilizes these sensors, and you can find suitable models just about anywhere. This site should give you a good idea of what you’re looking for: https://bestgaragedooropeners.review/chamberlain/. If you have an updated garage door opener then it’s important to make sure that the sensors are working properly. The last thing you want to do is have it close on your dog. Dogs often run up and down the stairs freely, so we may not even think twice when we see it happening. The problem comes though when the steps to the stairs are not carpeted. 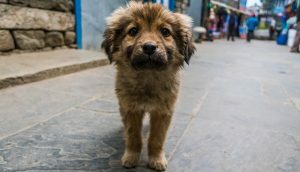 Dog’s feet will have a harder time catching a grip on non-carpeted surfaces, and if they’re used to running up and down stairs with carpeting they may get caught by surprise and take a tumble. This can become even more of a problem if the surfaces or the dog’s feet get wet, making them even more slippery. 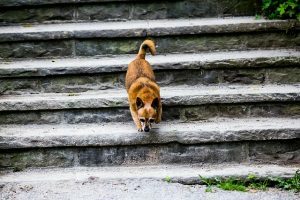 If you have stairs that are uncarpeted or you take your dog places where the stairs are uncarpeted pay extra attention to your dog’s safety while using them. If necessary install a barricade to keep the dog from running up and down without supervision. The last thing you want is for your poor pup to take a fall and get hurt. Lawn mowers are seemingly inconspicuous if they are used with caution, and you should certainly use extra caution when dogs are in the area. 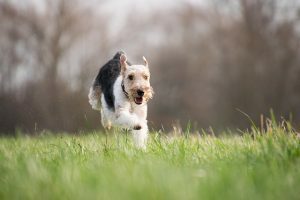 Dogs love to run around free and they may think you’re playing with them even when you’re not. The problem is that lawn mowers are very loud so when we’re using them we are someone blocked off from our senses. If a dog goes chasing a ball and ends up running into your lawn mower, it can just be too close for comfort. Even worse, the dog could actually get hurt by the lawn mower. To stay on the safe side, it’s better to have your dog stay inside while you are mowing the lawn. Alternatively you can keep them on a short leash during the times when you are operating the lawn more, and let them run free again once you’ve finished the job.